I’ve been thinking about how I’m going to write this blog post for months. With a race like this which covers 95 miles and 14000+ft of elevation, it is really difficult to find the right words, but here goes. But first, here’s the obligatory picture of my prize: The West Highland Way Race goblet. Pre-Race I was at times a nervous wreck and at other times just happily looking forward to getting out on the trail and enjoying the day. Despite this being my longest race\run I’ve done, I was probably the most calm for any of the races I’ve done. I’d had a busy week leading up to race day. Monday I flew to Munich and arrived after midnight, then a crap sleep in a hotel, long day in the office, flew home on Tuesday night arriving in Edinburgh close to midnight. It wasn’t exactly ideal a few days before a big race like this, but then most of my prep for the race hadn’t been either, so I figured I had nothing to lose. For support I had a couple of guys from the Lomies helping me out, Laurie and Kevin. Laurie, who is a veteran of the race, brought his grandson Tyler along for the experience too. We were using Laurie’s motor home which was a god send throughout the weekend. We arrived in Milngavie for registration at 9pm, then afterwards I climbed up into a bunk and slept for a couple of hours. Laurie woke me just after 12 and before I knew it I was toeing the start line alongside a number of other running friends after a quick selfie with my running buddy Scott. After a nice and steady start there was a big group shuffling along the path heading out of Milngavie when a cry went up from behind….”WRONG WAY!!!”. Someone up the front had been running with their head down and passed one of the WHW marker posts. Thankfully someone behind us knew where we were going. I found out this afternoon (Monday) when I went for a coffee with my mate Scott who was also running, that it was him who led us all astray…ha ha! After that mild drama, I settled into a nice slow and steady pace and enjoyed the running. Drymen came and went quickly enough, then the short distance to Conic Hill allowed the sun to start it’s rise and by the top of the hill we were back into daylight again. Balmaha was the first official check point and Laurie was there waiting with fresh bottles of tailwind for me. A quick bite of flapjack and I was back off running again. I almost took a wrong turn and headed directly to the loch side, but thankfully someone set me straight and I was off towards Rowardennan. By the time I reached Rowardennan, two things had happened. The first was that I’d remembered how much I disliked the loch side section. The second was that the midgies had woken up. Seemingly someone had told them that 199 sweaty runners and all their friends were coming to pay a visit and that it was free food day for midgies. I’ve been in the Highlands lots of times but have never seen swarms of midgies like it. It felt like we were running through a giant swarm of them for 3 hours. It wasn’t until long after Beinglas farm that the little bastards decided it was getting too hot for them and they were grounded for the rest of the day. 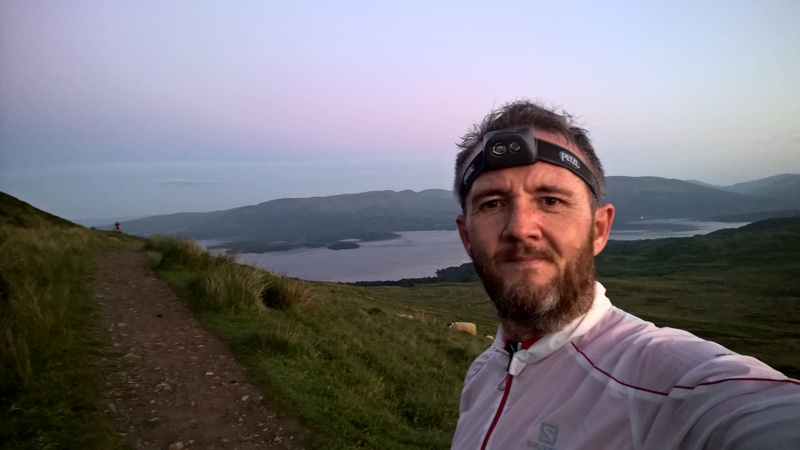 Meanwhile, in terms of running, the route used a low section of the WHW path along the loch which turned out to be gnarly, rocky and miserable just when your legs are already starting to feel tired. Knowing there was probably another 60 or so miles to go, it was also pretty mentally demoralising and I didn’t do well on this section at all. By the time we emerged out past Dario’s post and towards the farm, I was ready for some of the more open trails that I knew lay ahead. The section from Beinglas to Auchtertyre in the Fling just over a year ago seemed to last forever, thankfully on Saturday it seemed to come and go in a flash. Before I knew it I was passing under the A82, cow poo alley came and went and then the roller coaster near Crianlarich. By the time I hit the road crossing at the A82 again, I was feeling more human again and the misery of the loch side section was behind me. I reached Auchtertyre in 10h 52mins. This was way behind my target times for a 20hour finish, but I knew it wasn’t terrible and was happy to just go with the flow from here. I managed to meet John Kynaston at this CP who has been doing the WHW podcast series that I’ve been taking part in. It was great to meet John finally and I’m looking forward to being interviewed again later this week for the final podcast of this year. From Auchtertyre, it was a short loop around Tyndrum before heading out toward Bridge of Orchy. This section climbs a little out of Tyndrum, but then has long stretches of easily runnable downhill path. I felt great here. I’d had some soup from the support crew back at Auchtertyre which gave me a big lift. I’d had a swill down to rinse off the sweat and midgie paste that had covered me. Life was good. By Bridge of Orchy the sun was beating down and any breeze that had been around was now gone. It was getting hot. 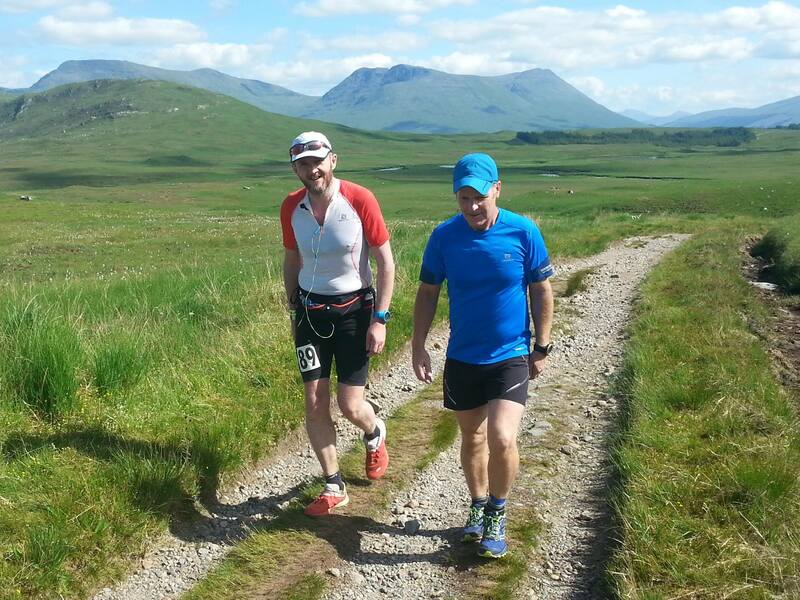 After another few minutes with the crew at the checkpoint, Kev offered to run Rannoch moor with me which I was happy to accept. He tried his best to keep my spirits up, but the heat was starting to get to me and I quickly drained all my water bottles. By the time we reached Ba Bridge, I was in a pretty poor state. Kev clambered down to fill up my bottles from the burn, and it helped a lot, but I wasn’t in the mood for even attempting a run. We slowly moved towards Glencoe, but everyone looked to be in the same situation. A couple of runners were being pushed on by their support runners. As inspiring as it was, I also suspected it was still too early in the race to push that hard and later saw most of them towards the finish, struggling to keep any sort of momentum going. I had a good rest at Glencoe and took it all in. I knew I would finish from here, it was always a mantra I had in my head. I was there in just over 16 hours which was over 2hrs behind my plan. It still meant that I could make the finish in under 24hrs if I put some effort in. With two big climbs still left to go, it wasn’t going to be easy, but off I went. My team met me at the bottom of the Devils Staircase to cheer me on. Despite feeling tired I still had good climbing speed with a power hike once I got moving. The weather was still wonderful and it was about 6pm at night now. With the sun shining off the hills, I couldn’t have wished for better scenery to spur me on. If I thought the climb up was bad, the descent down into Kinlochleven was horrible. It was one of the sections I thought I knew, but I know now that I really didn’t. I was long, rocky and made me wish I was at the finish. I remember from the Caley Challenge last year that the rocky section would end moving in this northerly direction, at the top of the fire road which leads up from the town. I remember the junction well and it was a relief to see it come into view. Then the long sweeping descent into Kinlochleven began. Once I crossed the river and headed out on to the road, the town had an eerie silence to it. There was nobody there. Where were the support crews, the cars and vans? Where was the race weigh in station I was expecting? All kinds of strange things filled my head about what was going on, then some kind lady screamed at me to go down the road and turn left. There waiting for me was more warm soup, a change of top and of course the rest of the race support. It’s amazing how your mind plays tricks on you after hours of running. With the weigh in done and my weight all normal, I headed out towards the big climb out of the town up on to Lairigmor. Laurie came along with me for most of this and was great. My legs were starting to seize up and it wasn’t until I was well into the climb did they feel useful again. Once up on the moor, I knew I had about 15 miles still left to do. I shuffled along, determined to keep momentum going. By now it was over 19hours in to the race. If I wanted to get in under 24hrs I had to keep moving. If I wanted to get in under 23hrs, then I had to open my legs a bit and run as much as I could. It was just about this point when I’d worked it out that some runners came flying past me. At first I thought they were relay runners but I later discovered that they weren’t. It was guys being pushed on hard by their support crews. Similar to when I’d seen it on Rannoch Moor, these guys would later suffer from going too fast and I think I ultimately finished ahead of all of them. The stretch across Lairigmor is painful. Aside from the obvious fatigue, the path seems to have eroded away quite heavily from the last time I was there and the rocks make it a challenge to keep any kind of pace. How the guys up the front managed to maintain speed over it just adds to my admiration for their abilities. This whole rocky trail simply compounds the magic trick that the WHW has in store for you at this point. That is of course that around every corner, there is always another long, lonely stretch of path awaiting for you that extends long into the distance. Just when you think you are done and that Lundavra can only be a mere matter of meters away, another 2 miles of trail weaves its way across the landscape ahead of you. Eventually, you reach the wilderness response team and they do their best to lift your spirits with a drink and some hearty encouragement. Then Lundavra appears and you know it isn’t far to go now. The guys there fired up The Proclaimers as I approached and it was great to hear the cheers after such a long stretch out in the wild. After Lundavra, I had an hour to get to the finish if I wanted to do this in under 23hrs. I knew that between me and a time I’d be overjoyed with, I had some ups and downs to go before a long climb up to the top of Glen Nevis. then a long descent to the Braveheart car park and finally about a mile on the road. I knew that if I could keep moving to the top of Glen Nevis, my legs were in a decent state and I could give it some welly* going down hill. The big fire road eventually came into sight. 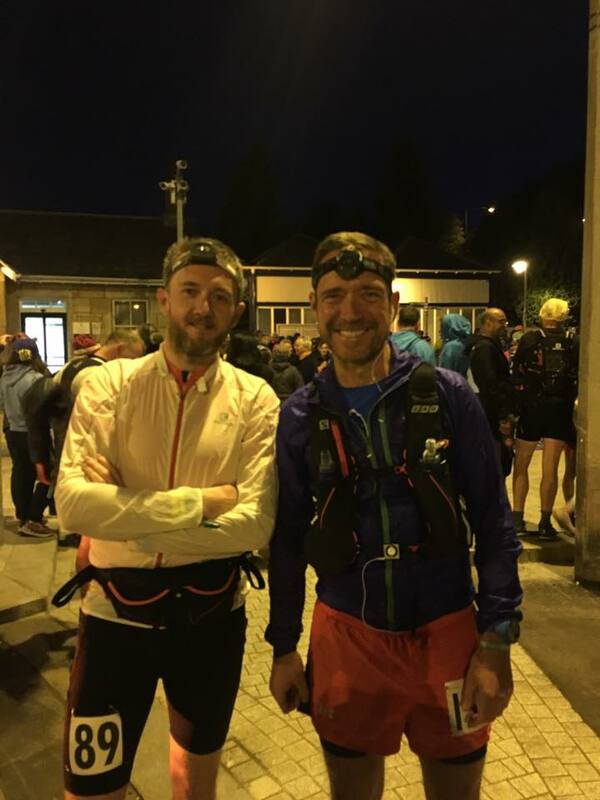 The head torch was on by now and that felt like another milestone opportunity missed; to finish without requiring a head torch for a second time. The downhill opened up and in my mind I was motoring now. A look at my watch and it was 22hrs15. A thought crossed my mind that I could make it with a slow shuffle, but I quickly did away with that. My legs were moving, my hips and quads felt strong, why shouldn’t I go for it? Opening my legs felt great and I came down as fast as I could in the dark. The road seemed to go on for so much longer than I remember it. On and on and on. Then eventually the car park and then the road. My memory of where the car park is compared to the small round about was also suspect I later discovered. Keep running, stretch the legs. Before I knew it, the WHW Race yellow painted arrows on the road led me into the leisure center and I dibbed in at 22hrs 49mins 36sec. Jubilation, exhilaration, epic, overjoyed, overwhelmed. All words that need to be involved with describing how I felt. 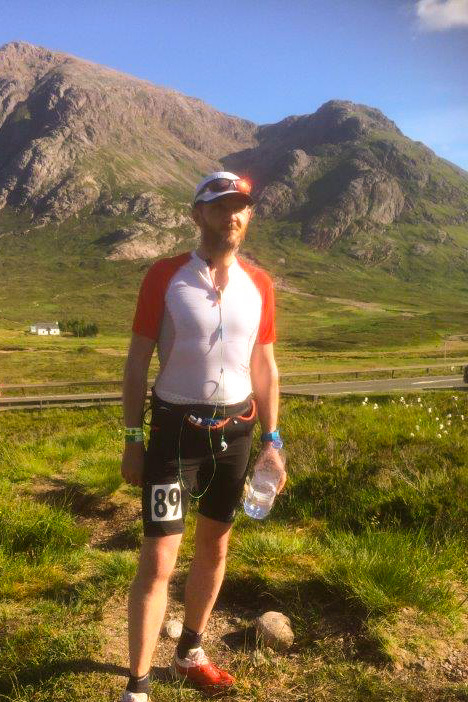 I remember someone thrusting a bit of paper with my times on it then the next thing I remember was being in the showers and wondering how the hell could I, a guy who could barely lift his arse off the sofa a few years ago, could run the WHW, in a race, and do it under 23 hours. I’m blown away and even sitting here now writing this it isn’t sinking in. My crew helped me get over a wobbly spell after a shower, then I had a massage from the team involved with the race who were amazing. Before long I was in the camper van, tucked up in a sleeping bag, dreaming about rocky trails. Race presentation came and went and marked the end of the weekend in style. My goblet is the most treasured thing I’ve ever earned and I suspect I won’t appreciate that fully for some time yet. I realised over the weekend how lucky I am to be able to do this type of thing. So many people can’t, not because they don’t want to, but because something gets in their way. I’m lucky, I have my health and I have amazing people who help and support me and it makes it possible to complete epic adventures like this and I will be forever grateful. I am also grateful to everyone involved in the race for making it such an incredible event. The support throughout the day was amazing, everyone was so passionate about making you feel good and cheering you on. You couldn’t wish for a better day. Huge congratulations to James Stewart who won in 15h 15m and to Lizzie Wrath who was first lady in 17h 42m. Incredible performances from those and everyone who finished, well done to you all and congratulations. I was delighted with my race overall. Lots of things I’d do differently, but I think you have to experience it once to know those things and I will perhaps write them up in another blog post soon. I didn’t get the 20 hours I was hoping for, but I always knew 24 hours was probably more realistic and it felt like the right challenge for me on the day. 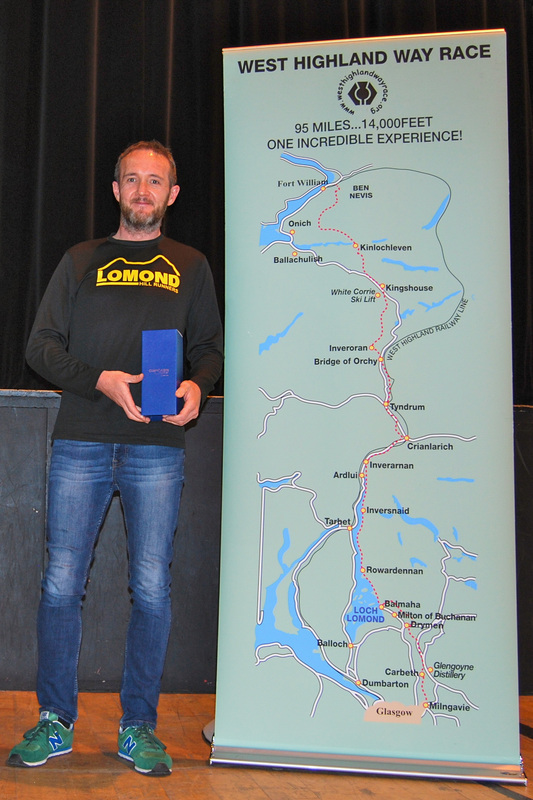 I tried to keep smiling all the way through but it was tough in places, but getting that goblet at the presentation certainly made me smile and forget about some of those low points. I also finished the podcast series that I’ve been doing with John Kynaston the week after the race. All the episodes can be found on the WHW race website.